Amazing tour where you see the highlights of the beautiful wildlife in Mexico. Mexico is rich of some remarkable animals that live in the jungles, waters, or land, such as the gigantic Whale Sharks that passes the waters of Isla Holbox, Isla Contoy and Isla Mujeres to feed on plankton from May to September. Other amazing animals that can be found here are Spider Monkeys, Bats, Snakes, Sea Turtles, Sailfish, Rays, Flamingos, many different Bird species, a possibility to see Jaguars and many more. During this tour, you will get in touch with the stunning na-ture, which is the natural habitat of all these wonderful creatures. Arrival at Cancun airport. Transfer to your hotel. Overnight in Cancun at Rey del Caribe or similar 3 star. 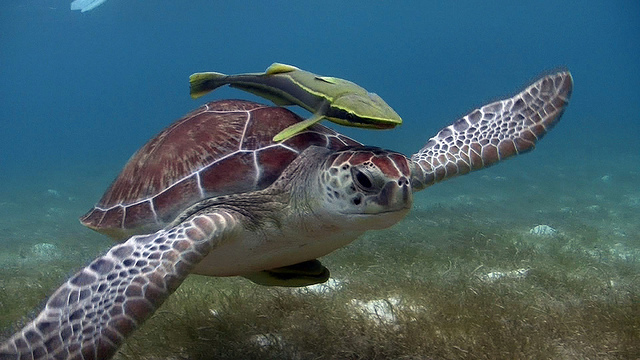 Snorkel with Sea Turtles! After this beautiful experience, you have the opportunity to swim in a cenote. The rest of the afternoon you will be spending in Tulum. Overnight in Tulum at Cabana los Lirios or similar. Start the day with bird watching. Continue to the Jaguar camp, where you go on a search for the largest cat in the Americas. After dinner, there will be a night hike, where you can see insects and small mammals. Over-night at a camp Jaguar. Early bird watching in the jungle or an early hike to search for Jaguars. Continue to the Kantemo cave, where you can see Hanging Boa Constrictors eating Bats. At night, bicycle through the jungle and go on a canoe trip to search for Crocodiles. Overnight in Kantemo cabins. Early bird watching and continue to Chichen Itza, archaeological site. Visit One of the New Seven Won-ders of the World and take a nice swim in the clear fresh water of a cenote. Overnight in Valladolid at Meson del Marques. See the amazing wildlife in the Rio Lagartos Biosphere Reserve. Take beautiful pictures of Flamingos, Birds and Crocodiles and be able to spot 395 species of birds that live and visit this amazing place. See Las Col-oradas to take pictures of the salt-water lake with different shades of pink. Overnight in Valladolid. Visit Tulum, archaeological site. Imagine a landscape with turquoise water, white brilliant sand and majes-tic ancient buildings over an impressive cliff. Enjoy the beach and transfer to your hotel. Overnight in Cancun at Marriott.